A blocked artery should be a major wake up call to address the risk factors that increase the chances of a heart attack. In order to reap the long-term benefits, prevent plaque formation in the arteries and decrease the probability of a heart attack, post-procedure care is very essential. Regular physical activity and modification in Indian diet after angioplasty ( Indian food for heart patients ) are usually recommended to reduce the cholesterol levels and the possibility of plaque buildup, thereby improving overall heart health. 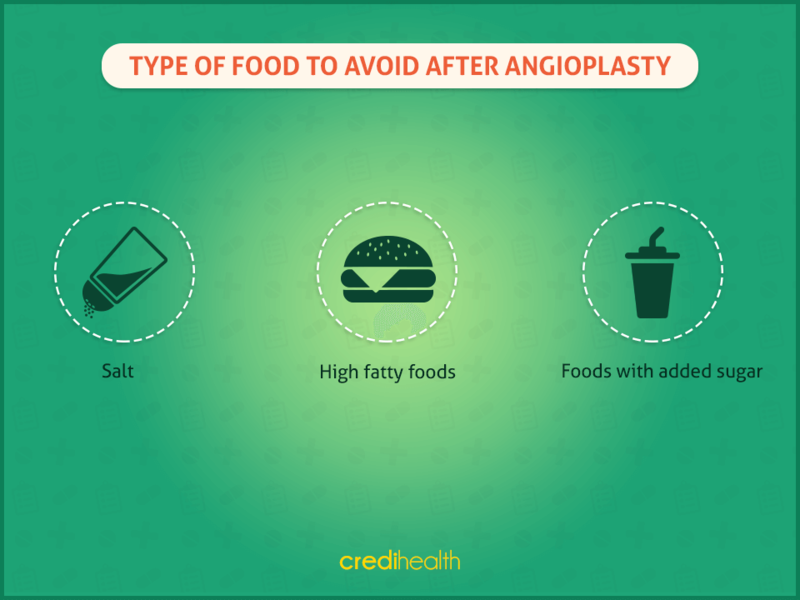 It is imperative to have a good understanding of what foods to avoid post angioplasty procedure. Maintaining a well-balanced diet plays an integral part in reducing further incidences of coronary artery disease. Eating right also guides the recuperation process. Therefore, it is vital that you stick to a diet chart prescribed by your cardiologist. Here are a couple of things to avoid when undergoing dietary changes after angioplasty. Reduced salt intake – helps to lower the blood pressure and contributes indirectly in reducing the heart’s-workload. You will be surprised to notice how quickly the taste buds acclimatize to the lower salt levels. Reduce your intake of trans-fats and saturated fats as they increase your chances of heart disease even when consumed in small portions. Highly processed foods and junk foods are rich in trans fats, therefore you should give these foods a skip while trying to move towards a healthy lifestyle. Foods containing saturated fatty acids are also not advised during weight reduction. Also, consume low-fat varieties of milk and yogurt, and avoid egg yolks. This includes products like bacon, ham, hot dogs, sausages, salami, corned beef, beef jerky, canned meat and meat-based sauces. These should be avoided as they contain a high degree of sodium, and other preservatives that can harm your heart. Therefore, one should if possible try to switch to a vegetarian diet after angioplasty or veg diet after angioplasty procedure. Reduce intake of caffeinated products and avoid all alcoholic beverages. Did you know? Appetite loss is a typical symptom of angioplasty! This means you may need to eat nourishing food at regular intervals. One does not have to reduce the consumption of all foods. What is essential is to maintain a balanced diet. One can definitely reduce the risk of developing cardiovascular disease by eating certain foods every day. Certain food items which help to provide your body with plenty of heart-protective nutrients like vitamins, antioxidants, minerals and dietary fibre should be preferably consumed. 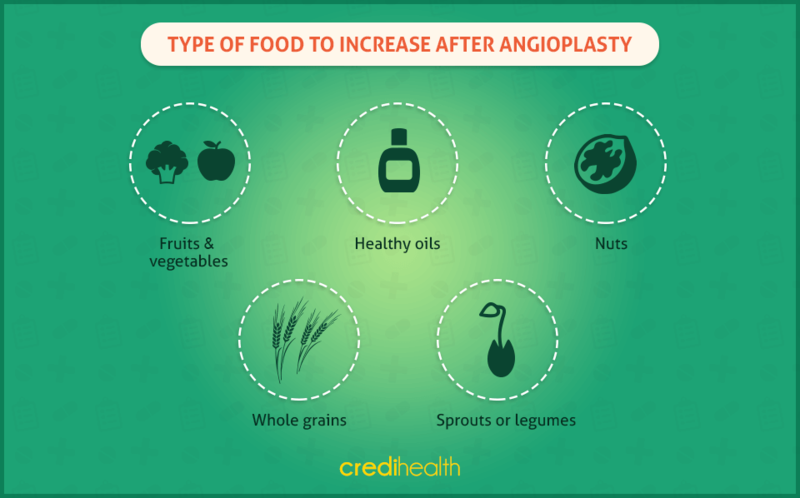 Mentioned below is a list of food items which should be included in a diet after angioplasty. Yes, your mumma was right. They are an essential component of the food pyramid and should make 4-6 portions each day. A key source of all the essential vitamins, minerals and fibre. They are quick sources of energy and yet calories poor. Try to eat them in their most natural form without adding too much of seasoning and toppings, that might contribute towards the calorie count. Not all fats are bad, in fact, few are essential as they help in building up the essential components of your body and good for lubricating joints. These include olive oil, peanut oil, and canola. Prefer to have poly-unsaturated fatty acids. Nuts are mini powerhouse full of fibre, proteins and essential fats. Consuming these on a daily basis is helpful. While almonds are rich in calcium and Vitamin E, cashews are rich in zinc, iron, magnesium. Walnuts are highly recommended as they are known antioxidants and are rich in omega 3. They also contribute significantly in lowering LDL. Try consuming whole grains instead of processed flour: they are rich in fibre, stuff you more and control your blood sugar levels. Oats, has been particularly beneficial in reducing the cholesterol content and it is rich in soluble fibre and move cholesterol out of the bloodstream. They provide fibre, help you stuff and supplement you with essential nutrients. When you need to sip on something soothing and calming, swing to freshly brewed tea and simply avoid packaged tea. Flavonoid-rich tea may help bring down the probability of undergoing cardiac problems and lowers the circulatory strain. There’s no preferable substitute for fluid loss than replenishing your body with water. When unwell, your body requires a substantial amount of water every day to function, fight off viruses, clear toxins and replace the fluids that are lost in the process. Keep away from caffeinated refreshments, since they cause water loss through the kidneys, which conflicts with your objective of remaining hydrated. One could also look at alternative ways of cooking, for instance, bake, steam, broil, stew, or boil instead of frying as this helps to reduce fat. This simple change may take the Indian diet after angioplasty a long way since Indians have a striking habit of frying everything. a Your diet is a powerful tool, if used pragmatically, can help to fight not only heart diseases but other ailments that come your way. While deaths due to heart diseases have reduced in recent years, it still continues to be one of the leading causes of death in the world. Therefore, it is more than evident that a healthy diet and living can make a huge difference in one’s life. Subsequently, one should not forget that each individual is distinctive and thus the right eating routine for healthy well-being may fluctuate from individual to individual. However, by following a varied eating regimen with a balance of all the necessary nutrients and avoiding undesirable supplements like sodium, soaked fats and sugar, you are well on your way to a sound body. The widely believed conception that exercises essentially entails only heavy and physically-strenuous activities is false. A physical activity like jogging, cycling (Health Benefits of Cycling), aerobics or even simple walking may have the same or even higher results. If you make such changes in your lifestyle, there is a very high likelihood that the progression of diseases will reduce if not stop. However, consult your doctor before you decide on an exercise schedule after an angioplasty procedure. Do not start with heavy and strenuous activities right away, start with very low-intensity exercises like walking, climbing stairs, etc. and increase your activity level gradually. Warm up before the exercise and cool down after you finish the exercise is critical. Try exercising at the same time every day as the body clock gets better adapted to the same. Do not exercise after meals and before or after bathing. Wear comfortable clothes and shoes and avoid exercising in extreme weather conditions. Always remember never to over-exert and stop if you are feeling low or tired. Therefore, coronary angioplasty can serve as a red flag to make dietary and lifestyle changes not only for better heart health but overall well-being. To ensure a healthy lifestyle post angioplasty, plan your dietary chart in collaboration with a nutritionist (Book appointment with Best Dietitian in India). The popular phrase “ You are what you eat ” is true because, according to a research, eating well plays an integral part in reducing your incidence of contracting major chronic diseases by 80%.